I make sure to include a Chinese dish or a stir-fry on the weekly menu. It is to add variety and more veggies in our meals. 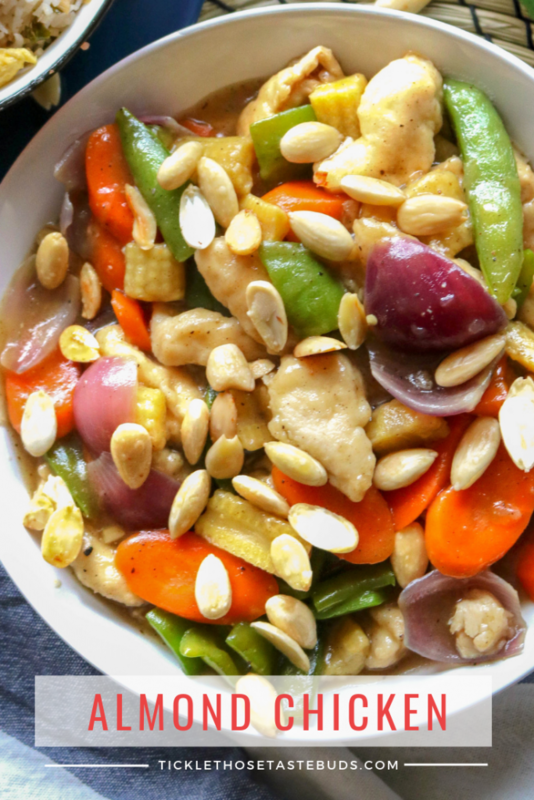 I had some left-over blanched almonds at hand and decided to used them for this Chinese Almond Chicken recipe. It turned out to be a delicious decision. Almond Chicken is a favourite dish of most. I remember as a family whenever we went out for dinner to a Chinese restaurant we always ordered Almond Chicken along with Chicken Manchurian of course. The flavours and textures in this dish are deliciously amazing. 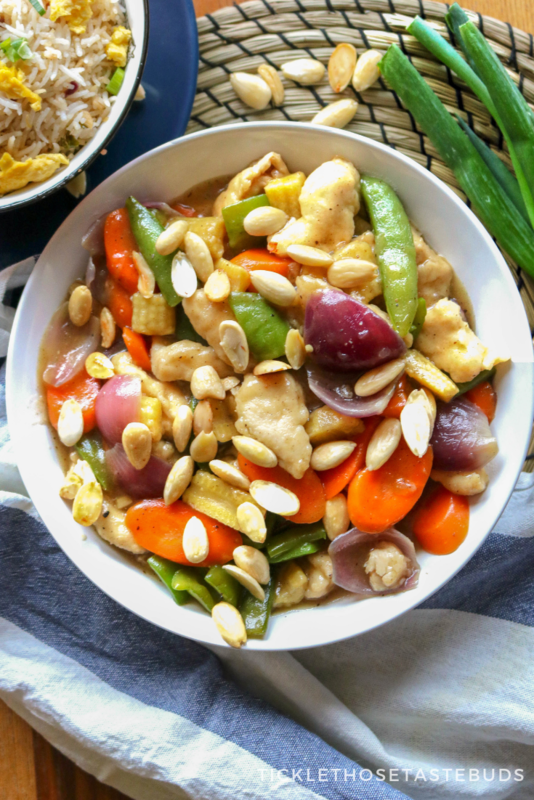 Stir-fry chicken with loads of colourful vegetables and toasted almond, all in a light savoury sauce is what makes it addictively delicious – and it comes together in just 30 minutes! The best thing about this dish is that you can use any vegetables of choice. I used the ones I had – carrots, onion, bell-pepper, sweet corn and snow peas. So use any vegetables your family likes. You can even add your choice of protein. I prefer it with chicken and used chicken breast in this recipe, you can use thighs too. The toasted almonds give a nice texture and crunch to the dish. 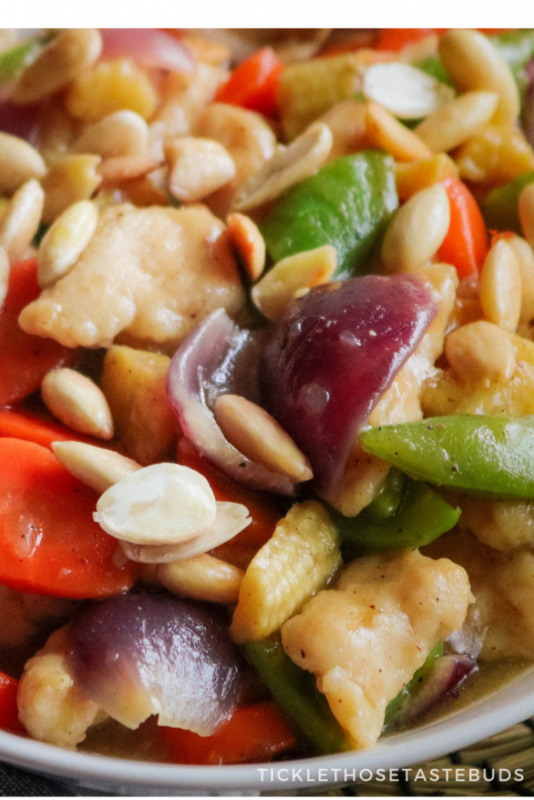 Every bite is accompanied with chicken, vegetables and crunchy almonds. The sauce is prepared with a few ingredients that you probably have in your pantry. It is a great dish for a weeknight dinner as it involves less cooking time so you can easily relax and do other things. It so filling and delicious that it can easily be a crowd pleaser dish to serve at lunch or dinner. Serve it with steamed rice, garlic rice or any rice you like. Weight-watchers can have it with quinoa, brown rice or even cauliflower rice – it tastes equally amazing. Try this recipe for Chinese Almond Chicken tonight and I promise you’d love it and your kids would love it too. And if you’re into leftover meals as lunch, it tastes even better the next day. Almond Chicken is packed with delicious flavours. 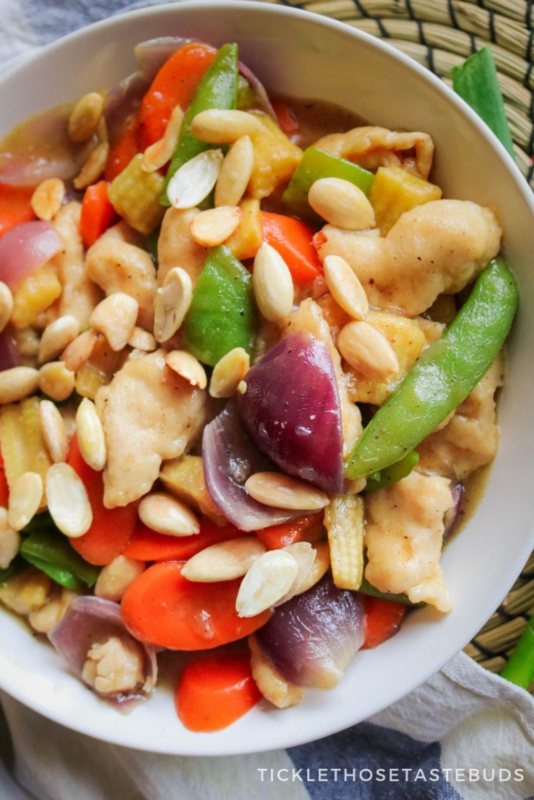 This stir fry of tender chicken, bright and colourful vegetables and crispy almonds in a light savoury sauce, is addictively delicious. In a small pan add 1 tbsp oil and fry the almonds. Keep stirring not to burn. Keep aside. In a pan or wok heat oil on medium-high heat. Add the chicken and stir fry until it turns white. Don’t overcrowd the wok. Remove chicken from pan onto on a plate. In the same pan or wok add 1 tbsp oil (if needed) add in the garlic and stir-fry until fragrant. Now add all the vegetables and stir fry until crisp and tender. Now add chicken to the pan along with the sauce. Mix it all together and bring it to a boil. Let simmer until the sauce thickens. To thicken the sauce add cornflour slurry (2 tbsp cornflour mixed with water) to the pan to desired consistency. As soon as the sauce thickens, dish and add toasted almonds. 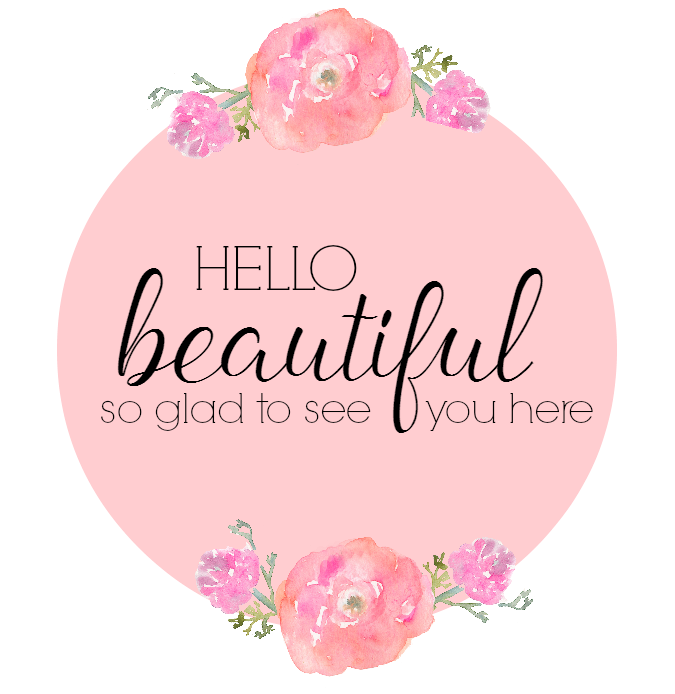 By the way, if you enjoy my recipes, I’d love for you to subscribe to my YouTube channel for Video Recipes. 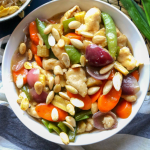 im always searching for new chicken recipes and i love the idea of having this chinese almond one to make this week YUM! It’s look so good and delicious. Thank you for this amazing recipe. My family would be interested in trying it I guess. Didn’t know about the oatmeal trick. Will check that out. As crazy as it sounds, ive never tried a chinese dish. 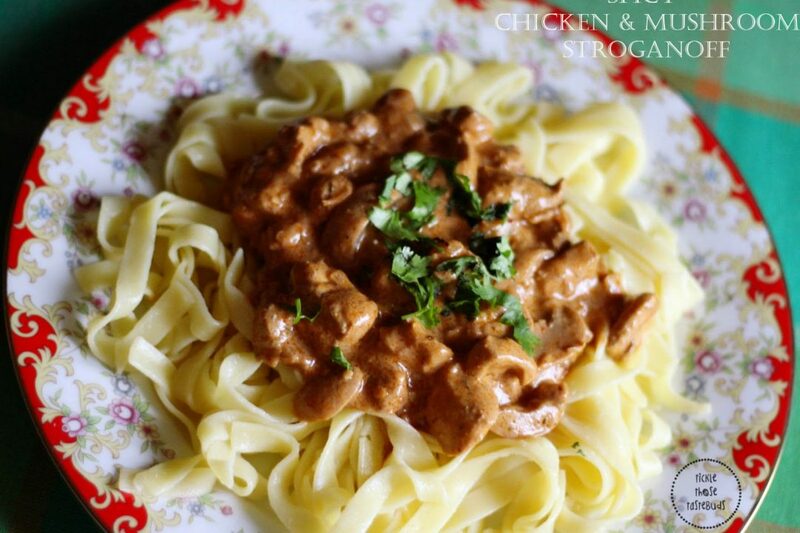 This looks absolutely delicious and fairly easy to make! This looks yummmy! I don’t cook because I’m not used to it, but this recipe looks delicious and healthy! Reading your post, I went to consult the menu of my favorite Chinese restaurant, and it turns out that it does not have it on their menu. I’m going to print your recipe, because I love Chinese food. guess what I’m cooking for the husband tonight? Chinese almond chicken it is! Thanks for the recipe sweetie! My kids really loved this so this is for sure a weekly recipe in our home now! So yummy! WOW. this sounds so delicious. I could never master making a chinese dish at home. I love how the photo you used slowly go nearer and nearer lol Felt like eating it already, Lunch time here lol so lets eat! Wow, I have never tried this recipe looks really delicious and easy. I will try to make this for my kids, thanks for sharing! What will be the alternate of white pepper? Would love to try this recipe. This looks really appetizing, although I can not cook chinese, will have to try this out following your tips.Thanks so much for sharing. GOODNESS this looks delicious!! I want to try this now! This dish looks amazingly delicious! 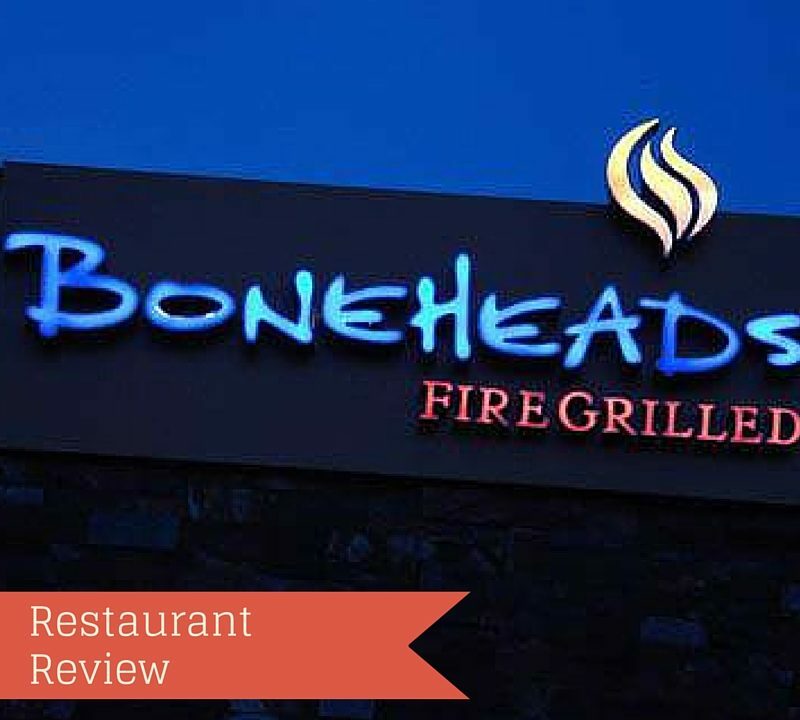 While I don’t eat meat, I know that my oldest son would love this recipe. I do like to order Chinese food and that Almond Chicken sounds really flavorful and delicious. Thank you so much for the recipe! Oh, this looks delicious! 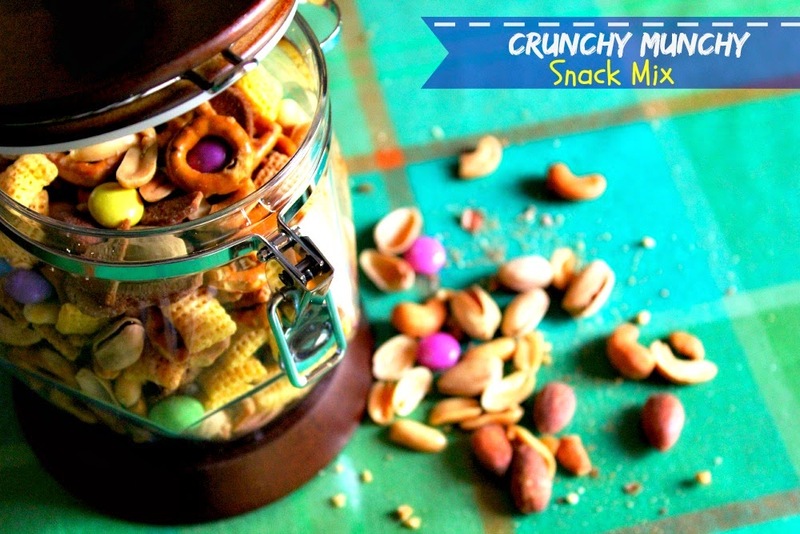 I have all the ingredients on hand, so I MUST make this! I’ve already saved the recipe to print out. This looks amazing, I might have to try to make this tomorrow! Thanks for sharing this recipe. I would love to prepare it. Looks very delicious, thank you for the recipe I will try it soon ..